The Department of the Middle East have been preparing to display a panel showing a pacing, roaring lion that was once was part of King Nebuchadnezzar II’s throne room in his palace in the ancient city of Babylon, Iraq. Alexandra Fletcher explains how the panel has been pieced together to be displayed for the very first time in London. As the weather turns colder and the days shorter the Museum has been loaned a reminder of warmer, sunnier climes, which is helping to beat the mid-winter chill. The Department of the Middle East is preparing to display a panel of glazed bricks that has been generously loaned to us by the Vorderasiatisches Museum, part of the Staatliche Museen zu Berlin group. The panel shows a pacing, roaring lion and once was part of King Nebuchadnezzar II’s throne room in his palace in the ancient city of Babylon, Iraq. Nebuchadnezzar II reigned from 605-562 BC, and supposedly had the hanging gardens of Babylon built for his queen. Although there is little evidence to confirm his passion for gardening, it is certain that Nebuchadnezzar commissioned other major building projects in Babylon, to glorify the capital of his empire. Inscriptions stamped on bricks reveal the extent of these works. 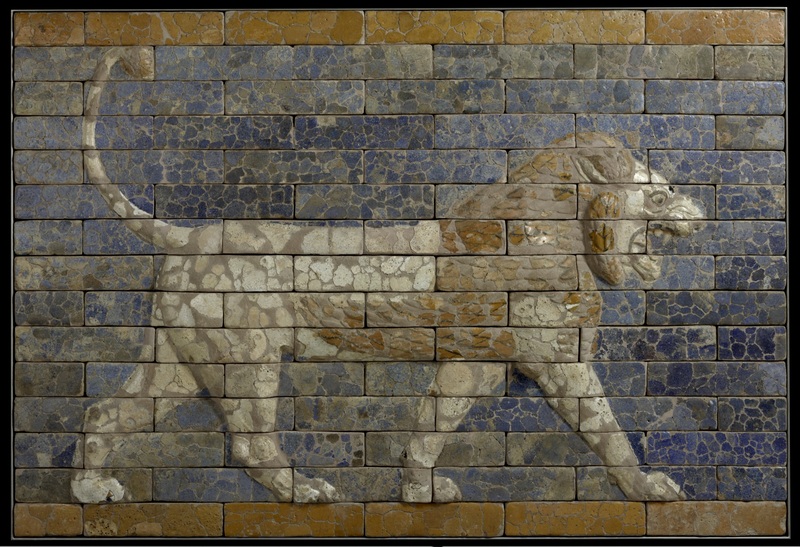 In the city of Babylon, glazed bricks in bright shades of blue, yellow and white were used to create public monuments that emphasised the power of the king and the gods. In Nebuchadnezzar’s throne room the roaring lions emphasized the power and might of the Babylonian king, whose empire stretched from the Persian Gulf to the Mediterranean and from the Caucasus to northern Arabia. Finds excavated by Robert Koldewey at Babylon between 1902 and 1914 came to Berlin packed in crates. Staff spent years painstakingly joining fragments of glazed brick together to recreate Nebuchadnezzar’s Ishtar Gate and Processional Way, in Berlin. The panel loaned to the British Museum has been similarly pieced together from bricks the Vorderasiatisches Museum has in store and so is being seen complete for the very first time in London.